In the first two parts of this series, I have discussed how to tell the different types of Venture Capital and Private Equity firms apart. 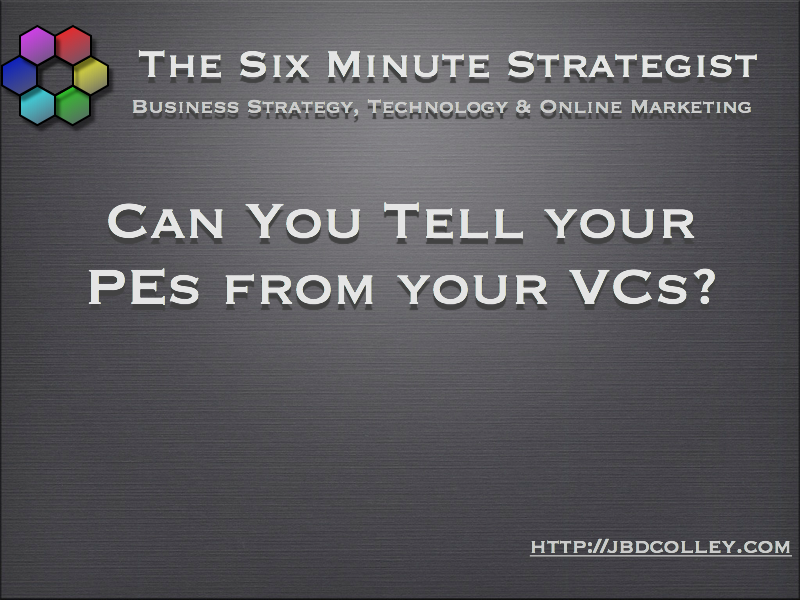 In this, Part 3, I will discuss how to approach VCs, what they are looking for in an investment and Six reasons why Business Plans are rejected. Assuming you have now identified your short list of investors from the hundreds out there, here are some key questions to ask yourself. How should I prepare my business information to make it attractive and digestible to the investor? What do investors expect to see in a Business Plan? What can we do to ensure that our deal gets attention within the firm? What sort of deal are we promoting and what is the best way to structure the financing of the deal which will give existing shareholders the best chance of making a high return while still being attractive to the investors? What sort of deal terms are investors likely to put forward and how are these likely to compare or vary between investors? Can we handle these negotiations on our own or should we find someone to help us manage this process? Investors invest in strong and credible management teams backed by a strong business plan (focused on a strong business proposition). Remember that if Investors see 500 to 1000 plans a year (and they do) but they only do 5 to 10 deals a year, your odds are no better than 100-1 against. The management team need to put together a strong, well laid out and comprehensive business plan which will be easy to read, clear, concise and compelling. The whole management team must be involved in the preparation of the plan and know it backwards. This ownership is key to being able to communicate the plan to investors with credibility. The plan should be realistic not optimistic. At the same time don’t do yourself down too much and expect the investors to run downside scenarios against you. Understand your market and its size, be realistic about the strengths and risks posed by your competitors. Be honest and straightforward, don’t leave skeletons in the cupboard. If due diligence subsequently reveals unexpected information, your potential investor will walk away. Your plan should put forward a compelling business case for investment in your business. You are competing with other potential deals here and your case must convince the investors that yours is the deal they want to do. The Business plan should scope the current business but prepare a financial plan going out at least three and preferably five years. I always recommend that you prepare a financial model on a 5 year monthly basis. It is easier to summarise this into annual periods than to try to reverse engineer an annual plan into 12 monthly segments. In operational terms you should be detailed about your plans for the first 24 months. Don’t forget you are explaining where you are now, where you want to get to and the route from here to there. 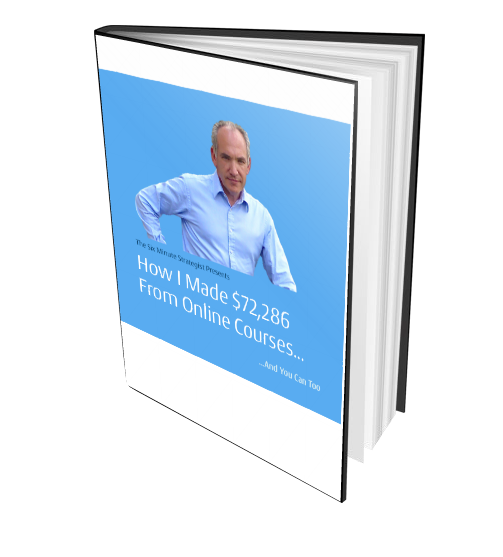 I will provide check list outlining the detailed structure of the financial plan in the Six Minute Strategist PRO when it launches but in essence you should be aiming to produce a word document of up to 50 pages. The financial model can be bound separately, if you print it out. Any bulky data sets should also be confined to the back of the document in apendicies. The front of the document should contain an executive summary which I always recommend you write once you have written the main plan. I have never understood how someone expects to summarise a document that has not yet been written. This part of the document must sell the deal as it is likely that this is the only part most of your audience will read initially when trying to select which deals to look at more closely. Try to understand your audience. Investors want to make a good return on their investment and minimise their risk of not getting their money back. It can help to talk to management teams from their portfolio companies if you can reach out to them to better understand the style and approach of a particular house. The presentation is vague, not well researched, verbose, non specific. Use short punchy specific sentences – like this one. There are specific omissions – possibly hiding negatives – which are not addressed honestly. When preparing a SWOT analysis, make sure you are candid about the weaknesses and threats! The financial model is too optimistic – avoid hockey stick scenarios. The returns are too low. As a rule of thumb, Venture Investors are looking for 5x to 10x returns on early stage deals. Private Equity investors seek to double their money in three years and treble it in five. This equates approximately to an IRR of 30%, but remember cash multiples are key, IRRs can be flattered, particularly over shorter time scales. In the final Part of this series, I will discuss the characteristics of a good financial plan and Six ways investors make money out of deals.